Bajaj is gearing itself up to launch the RE60 quadricycle and government is readying up the policy regarding the quadricycles. The latest word on the street is that the quadricycles might start plying on Indian roads by October 2013. The Ministry of Law and Justice has approved the alteration of the Central Motor Vehicles Regulation to get a new category of vehicles on board, the quadricycle category. The draft of this will be notified soon with a month’s time being given after that for suggestions to be given regarding the same as well. Bajaj Auto will surely be amongst the ones who will be looking forward to the policy. The Indian government is expected to allow goods and passenger carrier versions of the quadricycles for Indian roads. Quadricycles will have a maximum kerb weight of 450 kilograms when they’ll be carrying passengers and a maximum kerb weight of 550 kiograms when carrying goods. The top speed will be 70 kilometres per hour. It will have the capacity to accommodate 4 adults in case of passengers while the goods carrying quadricycles will have a seating capacity of 2. The letter Q will be put up on the front of the behicles to help people differentiate the all new class of vehicles from the existing ones. Coming to Bajaj Autos’ offering, it will come with a 200cc engine under the hood which will be a liquid cooled four stroke unit. It is expected to deliver a power output in the range of 18-20 BHP. It will be using the DTSi technology that Bajaj uses for its bikes and will deliver a fuel efficiency of 35 KMPL. It will come with a 2+2 or a 1+3 seating design. 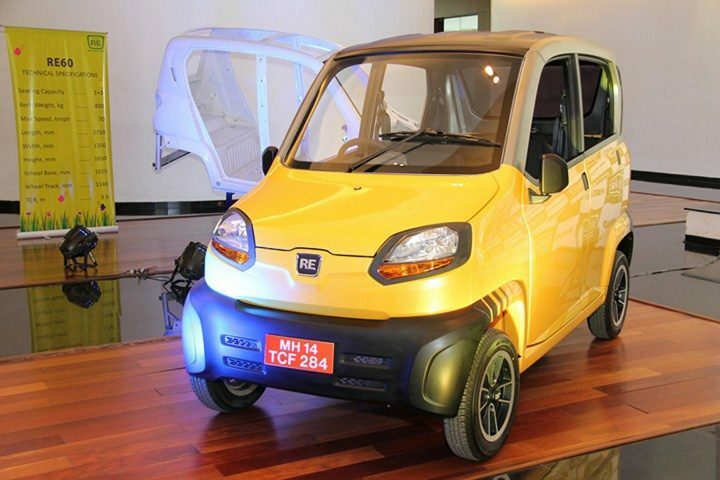 Bajaj Auto might also launch a CNG version of the RE60 as well. The quadricycle segment is totally unexplored in India and has the potential to become a serious threat to the auto rickshaws plying on Indian roads. With the government drafting out the policy and letting them hit the Indian roads by October this year, we might just witness public transportation getting a major revamp. What do you think about the new category of vehicles? Let us know in the comments.